Dr. Willemsen is a Professor for Functional Neurogenetics in the Department of Clinical Genetics at Erasmus University Medical Center in Rotterdam, the Netherlands. He is a leader in the development and characterization of genetic animal models for FXS (mouse and zebrafish). His research group has been involved in the understanding of the molecular basis of FXS and currently his group is focused on experimental approaches towards therapeutic intervention for FXS. The first avenue of research has resulted in several knockout mice for the Fmr1 gene, including conditional knockout, that are now used worldwide as the standard in (pre-clinical and fundamental research) studies for FXS. Dr. Frank Kooy is Professor in Cognitive Genetics at Department of Medical Genetics of the University of Antwerp. His research successfully focusses on the identification of genetic causes of cognitive disorders, such as intellectual disability and autism and to study the defective genes with the ultimate goal of developing rational therapies. 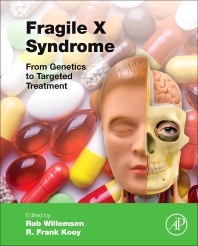 He has been involved in research on multiple aspects of the Fragile X Syndrome research for two decades.